Fears unite people, passing social classes. 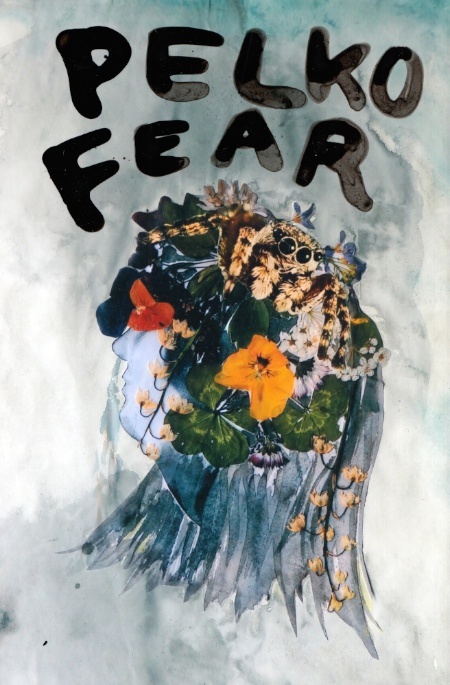 Pelko/Fear moves from detail to general, from local to global, from small to big; we talk about personal and local fears, that become general and global, at least at the level of thought. Personal fears are universal. We are asking, what do I fear. What do I skip because I’m afraid? Fear kills curiosity and restricts life. Do I turn my eyes away and why? Do I dare to look somebody into the eye, do I dare to face the issue, myself, the other? On the other hand, fear protects us and makes life more secure. Who is taking advantage of our fears, who is fearmongering, and why? When does creating security cause fear? Pelko/Fear is a conversational theatre piece. Valkeapää and Hoffrén are leading it, and presenting, now and then, some prepared scenes, like Bogeyman, Letters from the audience (Write a letter, and earn free entrance to the performance! ), Bottle-spinning, Death is afraid, and Fear gives wings, but the piece aims at diversity, multipolarity and safe unpredictability – by making the audience to participate, gently and stealthily. The performance suits schoolkids, and adults alike. It premieres at Hangö Teaterträff in June 2019. Before that Valkeapää & Hoffrén organize open rehearsals at Kanuti Gildi SAALi, Tallinn, in March, and at Lainsuojattomat, Pori, in May. The duration of the performance will be approx. 90 minutes. Pelko/Fear uses togetherness, words and discussion, stories, music, simple acts, and humour. The space reminds of living-room, creating kind of secure cave. Important visual elements are visual artist Niina Lehtonen-Braun’s collages, and drawings by kids of the Pukkila Art School, both made especially for Pelko/Fear. Valkeapää and Hoffrén’s previous work, Ten journeys to a place where nothing happens, premiered nine years ago, and toured widely around Finland and Europe. Its strength lay on presence, freedom it gave to the audience to be how they wanted to, and how it turned bunch of strangers into a temporary community. Ten journeys… toured widely around Finland and Europe. Pelko/Fear will be tourable as well. Hey, would you like to participate in the up-coming performance? Write us about fear, what it means to you. We are very grateful, if you choose to do so. We’ll handle the answers confidentally, and don’t mention your name, if you say so. 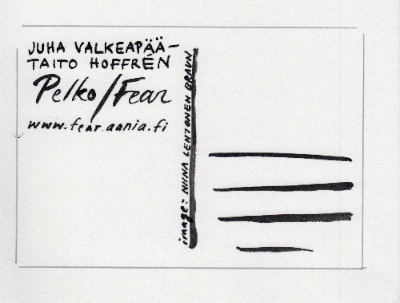 You can send your letter at pelko(at)juhavalkeapaa.net. Anxiety breathes with tiny swallows.